Good Friday is 19 April 2019. Easter Sunday is 21 April 2019. 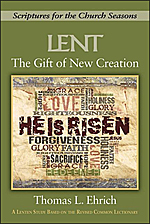 Please order your 2019 Lent and Easter resources (see listings below) in good time. A Beginner’s Guide to Holy Week. Pbk144pp. ISBN 9781501869556. Abingdon Press (2018). 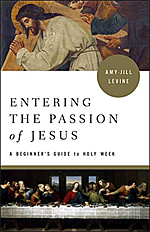 Author, professor, and Jewish scholar, Amy-Jill Levine dives deep into the biblical texts surrounding the Passion story in Entering the Passion of Jesus. Levine explores characters such as Judas, Pilate, Caiaphas, the disciples, and the women around Jesus to understand their relationships and roles in the Passion story. This Leader Guide contains everything needed to guide a group through the six-week study including session plans, activities, and discussion questions, as well as multiple format options. DVD US region 1 format. The six-session DVD features Dr Amy-Jill Levine offering a fresh, timely reinterpretation of the Passion of Jesus. The video segments are approximately 10-12 minutes each and, when combined with the six book chapters, make an ideal six-week group study. All videos sessions are closed captioned so you can display sub-titles. 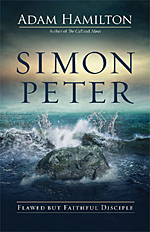 Simon Peter—an ordinary fisherman who heard an extraordinary call. He was not rich or educated but was familiar with hard work. He was quick-tempered and impetuous but possessed a passion that would change the world. He left everything to follow his teacher yet struggled with doubt and fear. The six-session DVD features Adam Hamilton on location in Israel and Italy. The video segments are approximately 10-12 minutes each and, when combined with the book, make an ideal six-week group study. All videos sessions are closed captioned so you can display sub-titles. This Youth Study Book takes the ideas presented in Adam Hamilton’s book and interprets them for young people aged 11-18 years. The Children’s Leader Guide contains session plans for younger and older children aged 5-11 years, including games, activities, craft ideas, and reproducible handouts. 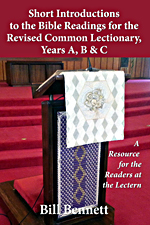 A Resource for the Readers at the Lectern. Bill Bennett. Would you like a simple, quick way to engage with the Revised Common Lectionary Old Testament, Epistle and Gospel readings for each Sunday and other important days in the church calendar, including Lent and Easter? Bill Bennett’s short introductions to each Bible reading will get you started. A Story of Jesus’ Last Days. Pbk 144pp. ISBN 9780664262693. Westminster John Knox (2017). This is Lectionary Year C which features Luke’s gospel. There are few open-ended “I wonder…” questions after each reflection to either ponder by yourself or in a group. We may have heard and read these stories lots of times, but then a sentence or two of Pritchard’s pops out of the page and offers a new idea to mull over. 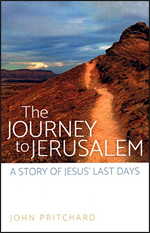 This book will reward a engaged day-by-day exploration in Lent. Five Events That Made Christianity: Christmas, Good Friday, Easter, Ascension and Pentecost. Jesus was a pest to the Romans and a threat to the religious leadership, so they hung him out like so much refuse. Little did they realise that it was like trying to put out a fire with petrol. The whole world exploded. 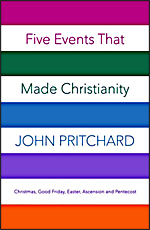 With characteristic style, John Pritchard takes us on pilgrimage to the Holy Land, as he unpacks the five great events that made Christianity – Christmas, Good Friday, Easter, Ascension and Pentecost. Absorbing, immediate and full of stories, this volume offers deeply considered theology, brilliantly communicated to connect with life as we actually experience it. 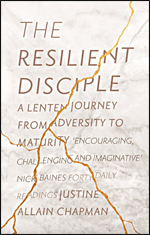 A Lenten Journey Through Adversity to Maturity. A Lenten pilgrimage is testing. We have to search within ourselves for answers which lie hidden, to draw on each other’s strengths, to reflect deeply and to trust that we will be enabled to integrate our many experiences. But there is a ‘bright flame before us, a guiding star above.’ And the God, who always calls us to love beyond ourselves, offers tender healing for our brokenness, longing that we may be consoled and renewed. 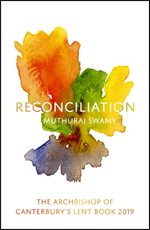 Forty biblically-based meditations introduce topics such as: Impediments to reconciliation – risking the self – humility and self-criticism – radical openness to the other – peace with justice. Questions for reflection are included, making Reconciliation suitable for use at weekly gatherings or for everyday devotion during Lent. Daily prayers for Lent and Holy Week. Each day’s two-page devotion begins with a simple call to prayer followed by a psalm verse and a brief scripture passage. Paolino’s daily reflections help you connect your everyday life with the call to repentance and conversion we hear during Lent. His insights and guidance are reinforced with a focused spiritual exercise for the day and summed up with a brief prayer asking God’s blessing, mercy, and courage. The compact size and affordable pricing make this ideal for individuals as well as bulk purchases in parishes, schools, diocesan offices and other Catholic settings. Liturgies and liturgical resources for New Year, Epiphany, Ash Wednesday, Maundy Thursday, Good Friday, Pentecost, Trinity Sunday, Advent and Christmas. A liturgy for an ‘ordinary day,’ and resources for special days like the UN International Day of Friendship and World AIDS Day. 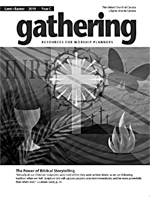 Includes full communion services and shorts acts of worship; liturgies for small groups and all-age gatherings and collections of resources that could be used to help shape liturgies, or at special events and gatherings. Dying and Rising on Planet Earth. 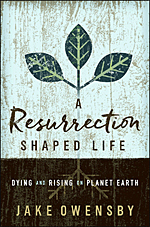 Owensby explains how we begin to experience resurrection in Christian practices such as repentance and forgiveness and discusses how new life emerges from our small deaths: suffering, shame, regret, and loss. [Currently out of stock at US supplier, allow 4-6 weeks]. The book of Psalms gives us a realistic look at the journey of faith for individuals and a community. From crying for help to singing songs of praise and thanksgiving – and everything in between – the psalms show faith with all its ups and downs, twists and turns. 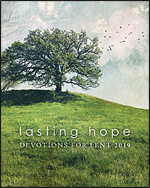 This beautiful, full-colour Lenten devotional explores the Psalms texts for Lent in year C of the Revised Common Lectionary with 40 entries, one for each day in Lent. Each reading is accompanied by a photo, a quote to ponder, a reflection, and a prayer. This accessible and colourful format makes it easy to incorporate a simple Christian observance into your Lenten journey. 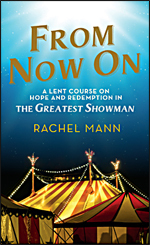 A Lent Course on Hope and Redemption in The Greatest Showman. A brilliant new Lent Course for 2019, based on the hugely popular film The Greatest Showman. The movie starring Hugh Jackman, about the founder and stars of the Barnum & Bailey Circus is ideal for Lenten study of Christian themes of hope, redemption and new life. A Million Dreams: exploring what liberation and hope might look like for an ‘outsider’ in the world. Come Alive: exploring how the family of faith can bring hope and purpose. Rewrite the stars: asks what forms of resistance can be placed in the way of salvation. Never Enough: questions the temptations of false fulfilment that can lead us to betrayal. Empathy – emotional identification and connection with others – is crucial to liturgical engagement, especially in the highly dramatic practices of the key events of the Christian Year. 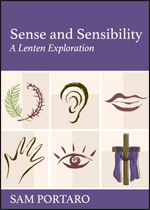 Portaro helps to restore our ability to participate emotionally in the Lenten journey by revisiting the five physical senses – one per week – in Lent. He encourages the reader to renew a relationship with the physical senses that is a prerequisite to a deeply attuned engagement with the biblical stories read, taught, and liturgically re-enacted in the rites of Ash Wednesday, Palm Sunday, Holy Week, and Easter. Scriptures for the Church Seasons. Ehrich invites us to explore God’s saving and redeeming love through a study of the lectionary Bible readings for Lent and Easter. Key Scriptures call us to prepare and contemplate God’s restoration and new creation through the death and resurrection of Jesus. Through the readings, we hear the invitation to embrace God’s salvation and the new life offered to us through Christ. The season of Lent offers opportunities to reflect on God’s redemptive action and to explore means of grace that help us move into new life in Christ. Transformation is a key focus of Lenten worship, study, and prayer. We will discover the salvation and renewal of creation revealed through the crucifixion and resurrection of Jesus. Includes commentary and reflection on readings from the Old Testament, the Gospels, and the Epistles. Scriptures for the Church Seasons. Thomas L Ehrich. A4 copied sheets. 92pp. ISSN 0823-1869. United Church of Canada (2018). $79.99, including postage in NZ. 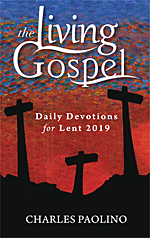 [2 copies of Lent & Easter 2019 in stock]. 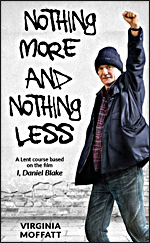 A new and original Lent course which uses the powerful, multi-award winning film I, Daniel Blake, directed by Ken Loach and written by Paul Laverty, as an opportunity for us to question why so many people in our society are suffering, what causes injustice and oppression – looking at examples from Jesus’ time as well as today – and what we can do in response. 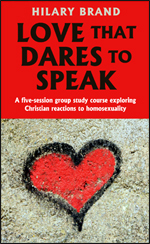 A five-session group study course exploring Christian reactions to homosexuality. Darton Longman + Todd (2019). Disagreements over issues relating to homosexuality are perhaps the biggest challenge facing the Christian Church today. Brand provides an opportunity for people of differing opinions and experiences within small church groups to explore the issues together; to share views and questions, to find out what the Bible actually said about being gay, and to gain deeper understanding. It brings into focus deeper issues about how we as Christians form our ethical opinions, and how we react to a changing society. Leader’s notes are included for each session, and the book includes useful appendices for background information. The material is intended for small groups but could be usefully done as an individual study. Explore how, on a cosmic and a personal level, darkness gives way to light. 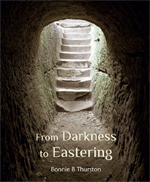 It does not sugar-coat the reality of darkness but is full of hope, reminding voyagers that ‘light shines in the darkness,’ that darkness is required to perceive light – and that Easter means the light has come, life triumphs, and the promised Holy Spirit will empower us for growth. 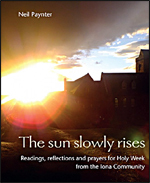 Readings, reflections and prayers for Holy Week from the Iona Community. Bible readings, reflections and prayers for the days of Holy Week. Also a large section of resources, including ‘Prayers on the seven words from the Cross,’ ‘A service of lamentation to liberate us for action,’ poems, meditations, and reflections. The sun slowly rises on city streets where saints trail and spread God’s light. The sun slowly rises in Glasgow classrooms where folk teach English as a second language to refugees and asylum seekers. The sun slowly rises at islands for world peace and over Iona Abbey. It rises on farms in Palestine where folk plant olive trees and work to grow peace from the ground up. It rises where street pastors hand out bandages and love. Prayers and reflections for Lent. 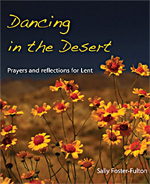 Reflections, meditations, prayers, activities and liturgies for Lent. Includes a liturgy for Mother’s Day, worship for Ash Wednesday, an all-age service for Shrove Tuesday for making and sharing pancakes, and other all-age resources. 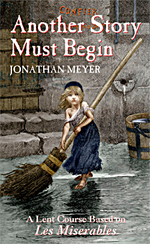 A Lent Course Based on Les Miserables. Darton Longman + Todd (2014). [10 in stock, then allow 3 weeks]. A Lent course based on the film, the novel and the stage adaptation of Victor Hugo’s Les Miserables. Through discussion of some of the themes and principal characters of this epic narrative, the course explores the grace of God and our own fallen state and opportunity for redemption, and helps us to reassess what we can do with our lives and for those around us. A Lent Course based on Casablanca. 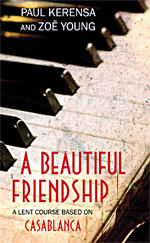 The book is designed to be studied by groups or individuals alongside the DVD of Casablanca, starring Humphrey Bogart and Ingrid Bergman. The classic movie Casablanca provides a great basis for discussion of themes of sacrifice, repentance, suffering, loss and hope at Lent. Its wartime setting provides additional poignancy for study at a time of continued armed conflict around the world as well as the centenary remembrance of the first world war. 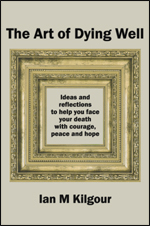 The book includes leaders’ notes, timings for film clips, discussion-starters, reflections and prayers. 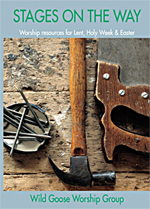 Worship Resources for Lent, Holy Week and Easter. Prayers, meditations, litanies, readings, responses, scripts, symbolic actions and more, tracing Jesus’ road to the cross through Lent, Holy Week and Easter. These are worship resources that enable people to sense the hope, apprehension and joy of Easter as felt by Jesus’ friends. 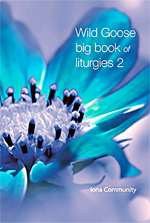 The range and diversity offers a unique source of elements for lay and clergy worship planners and enablers. All of the material has been used in celebrations and services of public worship.